Unaffordable prices, unavailable medicines, a rising need for accessible noncommunicable diseases treatments – these set the stage as the World Health Organization Executive Board started discussion today on one of the more contentious issues of the week. For the Board’s approval is in particular a roadmap and action plan including a dual strategy based on safety and efficacy of health products, and their affordability. WHO regional director for the South East Asia (SEARO) region Poonam Khetrapal Singh took the floor to introduce the proposed roadmap at the close of the morning session of the Executive Board, which is meeting from 24 January to 1 February. Board members are expected to consider two documents on this topic: Medicines, vaccines and health products; Access to medicines and vaccines [pdf]; and Medicines, vaccines and health products; Cancer medicines [pdf]. At the last World Health Assembly (in May 2018), member states asked that the WHO devise a roadmap and action plan to increase access to medicines, and requested that this roadmap be drafted in consultation with member states, which have been carried out, according to Singh. The draft roadmap for 2019-2023 also reflects the aims of the 13th WHO General Programme of Work, adopted last May, she said. Although progress has been made in access to medicines, it has been very uneven with the poor and vulnerable being “disproportionately affected,” Singh said. Health needs are changing and there is a rising need for affordable medicines for noncommunicable diseases. Medicines are often inaccessible, they are very expensive, and are the biggest driver of out-of-pocket expenses, she explained. In some regions, such as South East Asia, it almost accounts for 80 percent of those expenses, she added. The draft roadmap includes two strategies to improve access to medicines: the first is to ensure quality, safety, and efficacy of health products, and the second is improving equitable access, Singh detailed. The South East Asia region is a major producer of medicines and vaccines, she said, adding that some countries with large population have manufacturing capacities, while countries with a very small population have few opportunities to benefit from economies of scale when they purchase medicines. This is a global issue for all countries with a small population, she said. Singh mentioned the Delhi Declaration [pdf] “Improving Access To Essential Medical Products in the South-East Asia Region And Beyond,” signed in September 2018 by health ministers of SEARO during the 71st session of the WHO Regional Committee for South-East Asia. “We included medicines, vaccines, devices and diagnostics,” she said, encompassing a holistic approach to health products. The declaration also call for sustaining the momentum for regional collaboration, Singh added. 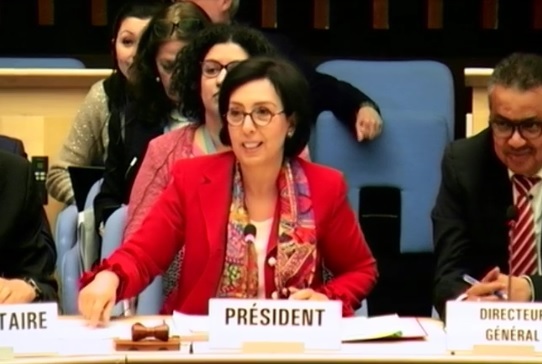 "WHO Holds Discussions On Roadmap For Improving Access To Medicines" by Intellectual Property Watch is licensed under a Creative Commons Attribution-NonCommercial-ShareAlike 4.0 International License.